Are you feeling stuck in your current job and need that certain something to get to the next level? In this multi-session audio program, you'll get strategies from experts to supercharge your career. Gain practical skills for moving-up and securing job promotions. Discover the key elements of an effective elevator speech. Create a personal vision statement to guide your daily actions. Develop the self-discipline for exceptional performance. 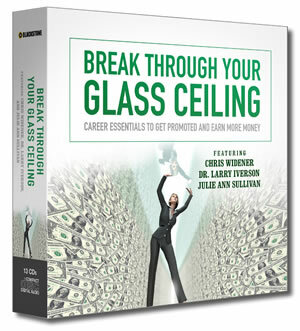 With Break Through Your Glass Ceiling, you will leverage a proven system which highly paid professionals rely on to achieve promotions. Get to the next rung on the corporate ladder and give your career a boost. You work hard and you've earned it!